I hope you are having a lovely week so far, we are half way through! I don’t know about you but it has been a long hard work for me, I cannot wait till the weekend. But that is nothing new to me haha Today’s outfit was inspired by my weakness… mint chocolate anything! I am not a huge sweets person, I prefer carbs and grease LOL However, if it is mint I go weak at the knees and must have it. So It was only natural for me to pair this super cute mint peplum top with some sweet chocolaty pants. Peplum is such a chic feminine look that will always be in style, it is SO flattering for the woman body I cannot get enough of them. Do yourself a favor this season and hop on the Peplum wagon! Thanks for stopping by, have a great day! P.S. Did anyone get pranked on April fools?? Tell me all about it I love April fools day! Love this peplum look! The color is gorgeous and perfect for the Easter holiday! SO adorable! Love that shirt! Beautiful, I LOVE that pastel green color on you!! The shoes are awesome too, they remind me a bit of the Stuart Weitzman Nudist, but are much more fun! Thanks Jill you always know how to make my day! How pretty is mint on you?! And I love it with the leather-paneled leggings. Ashley you are just the sweetest thanks for the compliment hon! 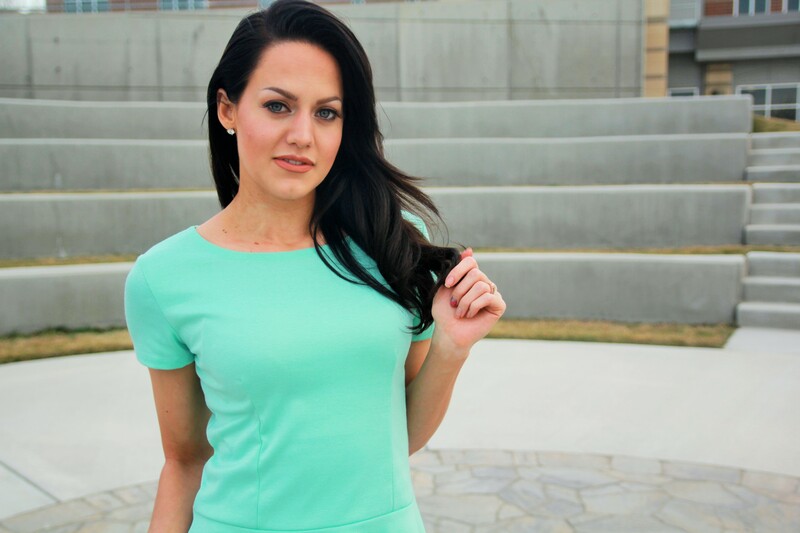 That turquoise peplum top looks gorgeous on you! I love that peplum top! The colour is just beautiful, and it looks fabulous with those leather pants. I love this peplum top! So cute the whole outfit is great! Love your top, perfect colour for spring. Lovely, this look is soo cool! You look AMAZING!! Swooning over your leather pants!! So rocker chic! Sending you much love! You look amazing! Love the leather leggings in combination with that pastel peplum top! Thank you Xenia so sweet! I’m with you girl thanks for stopping by ! Edgy and chic look. 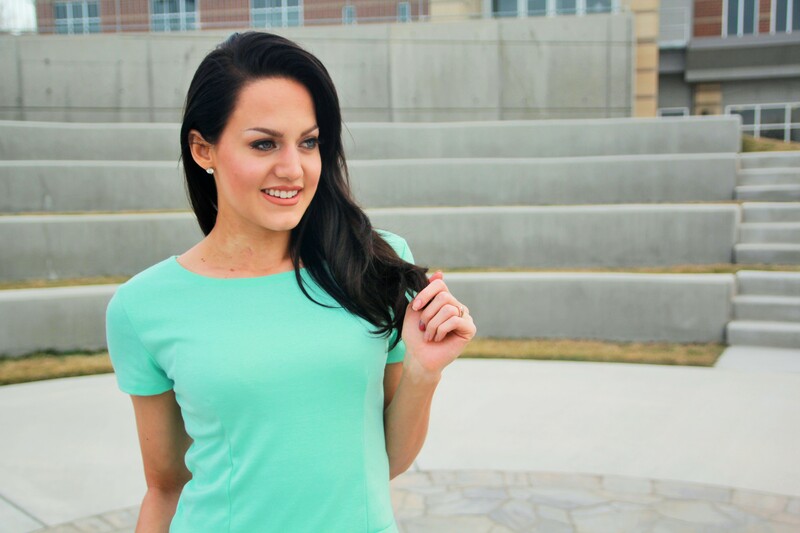 I loooove the cute mint peplum top! Love this look! I love the color of the top and your shoes are gorgeous. Oh you are so sweet thanks Christine! Such a flattering compliment thanks Borka! Thanks robin that is so sweet! Gorgeous outfit! I love that it was inspired by mint chocolate, because I love it too! I know it seriously is the best! Thanks for stopping by Carly! Love the top, such a nice color! Thank you Angela, happy easter to you too! Thanks Vanessa I hope you had a lovely easter as well! Like you said, these types of tops are flattering and this top is so super flattering on you, you look so gorgeous! Love the whole outfit too! Hope you had a great start to your week (I think the U.S. gets Easter Monday off, right? Not us here in Canada! 😦 ). XO, B. Born in South Africa, but raised near Toronto! I think Lethbridge is quite a ways away aha! 😉 If you’re ever near Toronto let me know! Mint looks gorgeous on you!